What Time Is It? Find out at Champ’s Clock Shop in Douglasville, Georgia! 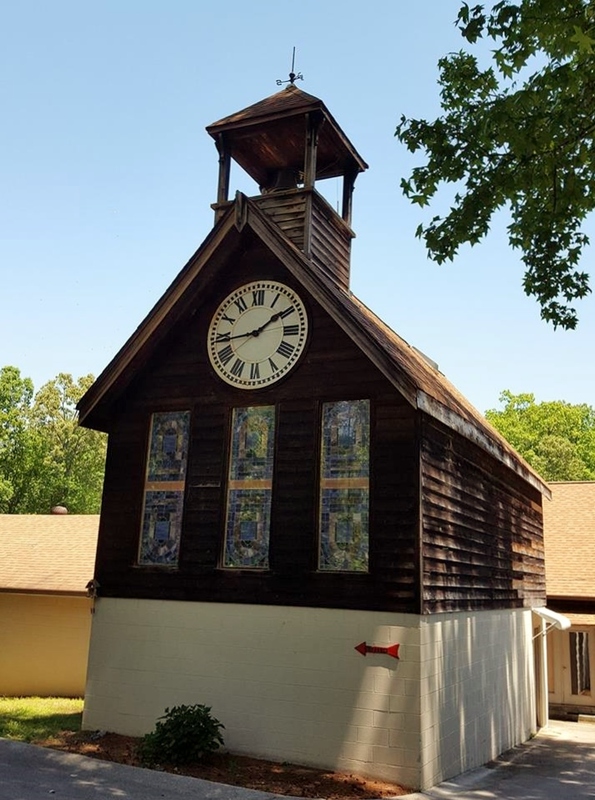 Would you believe the world’s largest real cuckoo clock hangs on a wall just a few miles from Atlanta? 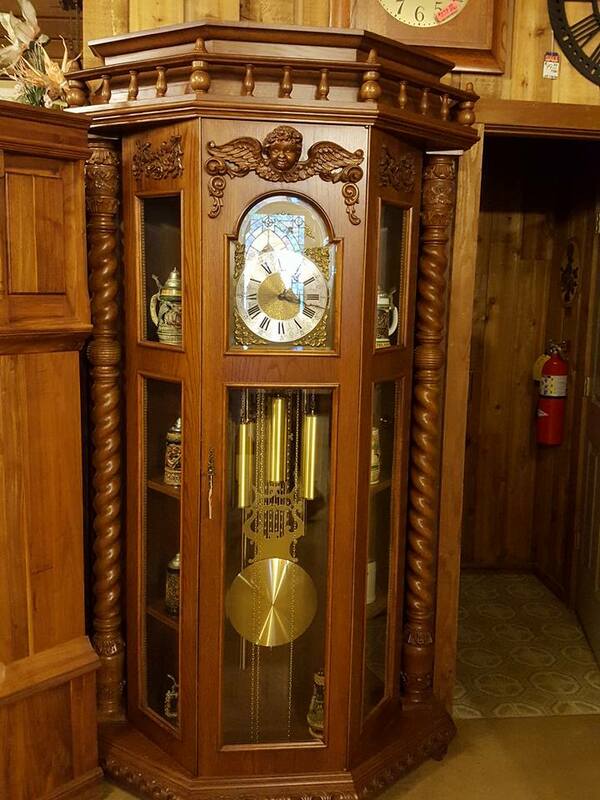 How about the last fully American-made grandfather clock? 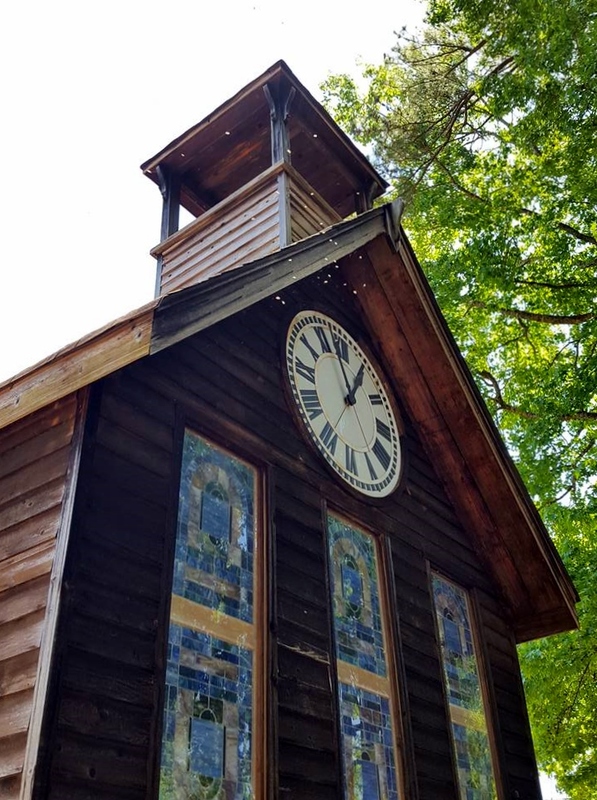 The only known, working, mechanical tower clock in Georgia? 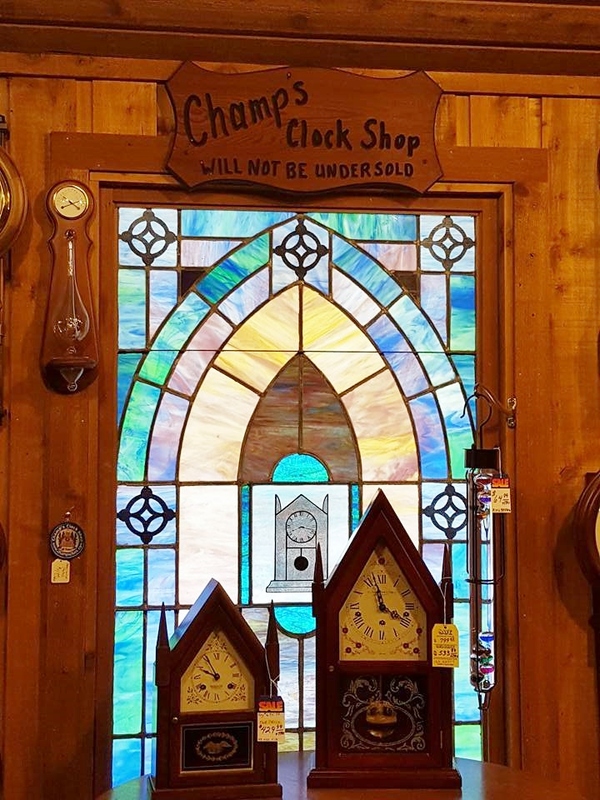 All these unique clocks, and many more, can be found at Champ’s Clock Shop outside Douglasville, Georgia. Located on a quiet, country road, it’s worth the drive. There’s only a small sign, so be on the lookout for it. The shop looks like a rustic chapel with a clock tower. As you walk from the parking area to the door, it’s so peaceful that you may be able to hear a buzzing sound. It’s the resident beehive, in the clock tower. (The bees are the white dots in the photo below.) The bees have been there for years, and have been moved a few times, but they keep coming back. They must like it there, and you will, too. 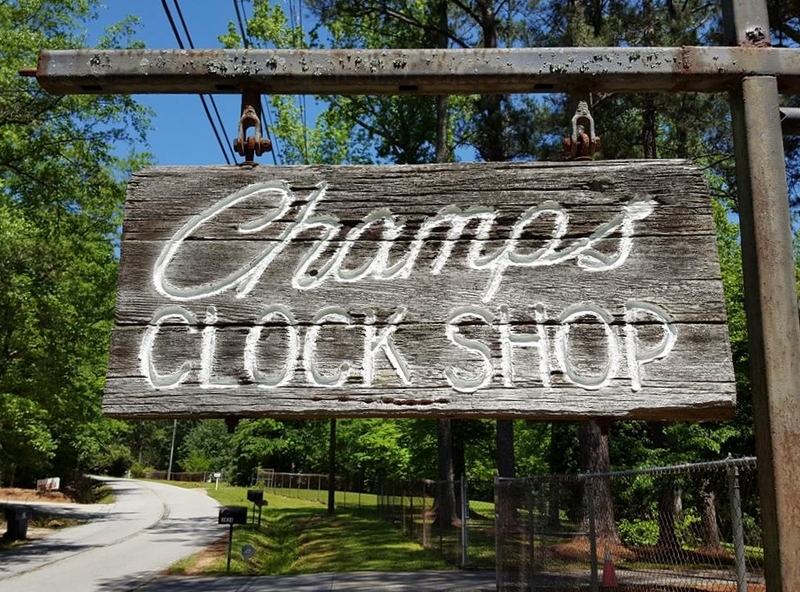 Part store, part museum, part tourist attraction, Champ’s Clock Shop has been family owned and operated, in its original location, since 1967. The late William Jerry (Champ) Champion started repairing clocks, as a hobby, while working as a firefighter for the City of Atlanta. His locker at work became jokingly referred to as Champ’s Clock Shop, because co-workers would leave their broken clocks inside to be fixed. Through mostly word of mouth, Champ’s hobby grew to become the world’s largest and finest selection of clocks. Champ built the shop as an addition to his garage, over the years, as money was available. Jeff, Champ’s son began working here with his dad in 1976, and is currently general manager and the main service technician. 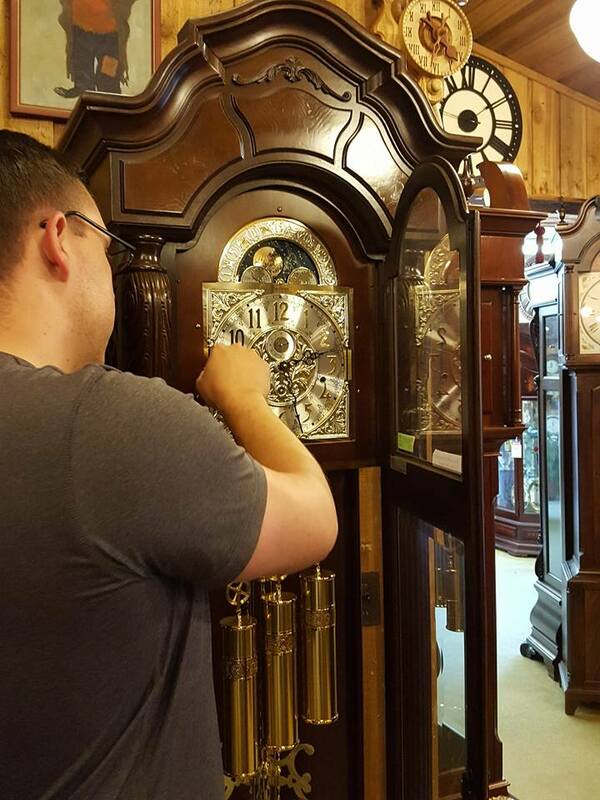 Nick, Jeff’s son, began working in the shop full time in 2014, and is the third generation in the clock business. Pat, Jeff’s aunt-in-law has been at Champ’s for 20 years. She handles sales and service. She’s also a Rhythm Clock Repair Specialist. Andrew, Jeff’s brother-in-law, has been repairing all kinds of clocks since 2011, when he started as an apprentice. If you have a clock sitting around that doesn’t work properly, this may be just the place to finally get it fixed. When you enter the shop, you’ll be amazed by the impressive variety. There are clocks of every imaginable shape and size: grandfather clocks, grandmother clocks, wall clocks, cuckoo clocks, antique kitchen clocks, modern clocks, mantel clocks and Kit-Cat clocks (shaped like a cat with eyes and tail that move back and forth). 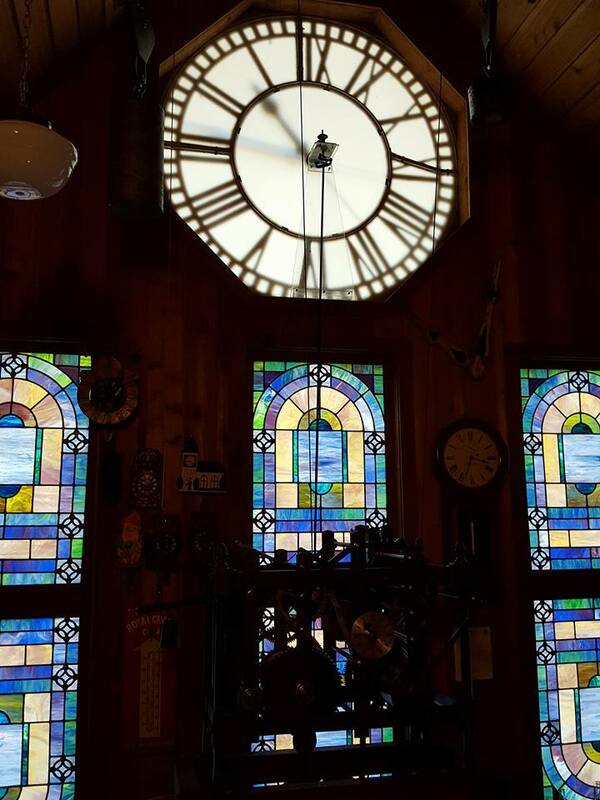 Did you know that any clock over 6 feet tall is a grandfather clock, no matter the shape? Grandmother clocks are under 6 feet. Just about any time you visit, you may be greeted by the delightful Sharon, Champ’s widow. Be sure to ask her for a tour of the shop. She’ll even demonstrate how some of the clocks operate. The clock in the bell tower on the front of the building actually works. It was built in 1865 in London; however, it was found in Connecticut and moved to Georgia many years later. It has been completely refurbished and, as far as they know, it is the only mechanical working tower clock in Georgia. It strikes a 300-lb. bell on top of the tower, with a 10-lb. hammer and can be heard over a mile away. When you go inside the shop, be sure to ask to see it. It is definitely worth climbing the stairs to see this interesting timepiece. There are also several other antique clocks on the shelves upstairs that are worth a look. 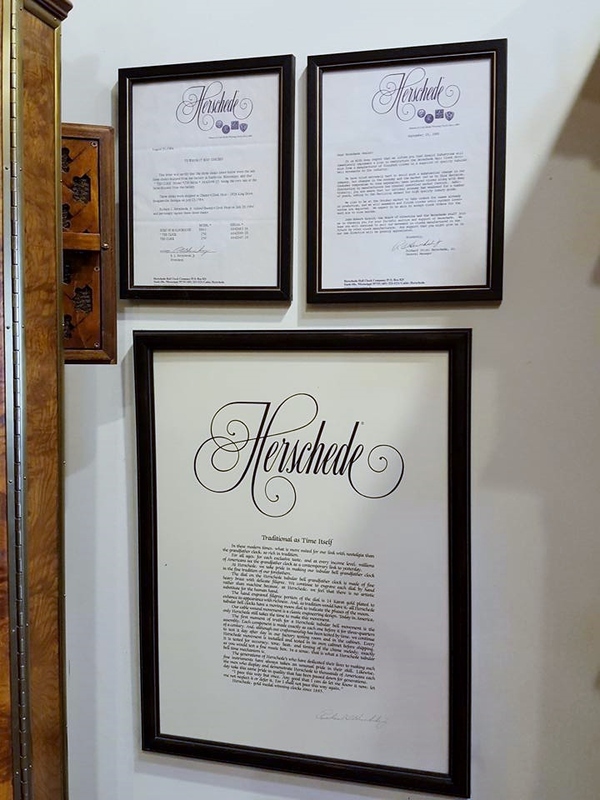 One of the gems in the shop is the last Herschede Clock to be manufactured by the Original Herschede Hall Clock Company. 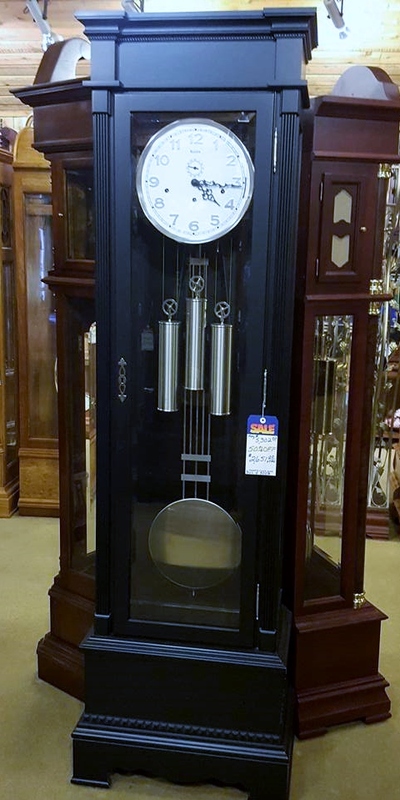 Built in 1984, in Starkville, Mississippi, this clock was not just the last Herschede, it represents the last grandfather clock completely made in the USA . Framed certification and letters hang on the wall beside it. 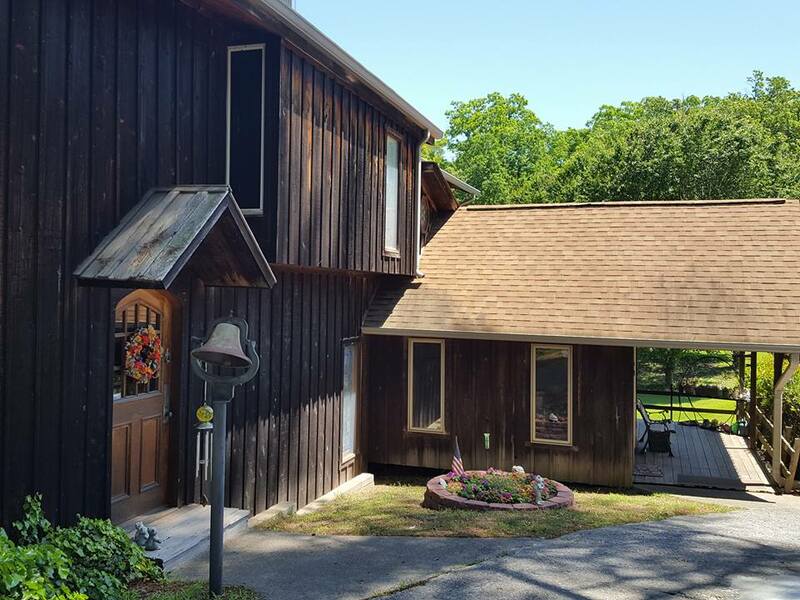 Asking price: $125,000. This clock is really special. The shop’s showpiece is the the world’s largest working, real cuckoo clock, hanging on a wall, that isn’t part of a building or billboard. 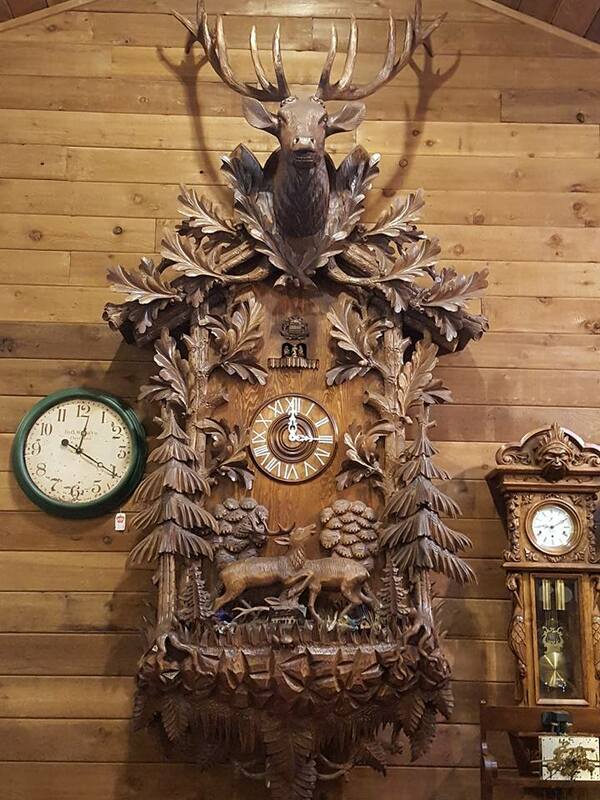 Over 13 feet tall, with a full-scale carved stag head on it, this exquisite clock hangs on a single screw. This clock was commissioned by Champ himself in 1986, and built by Dold Exquisit in the Black Forest of Germany. It was hand-carved from Black Forest trees. 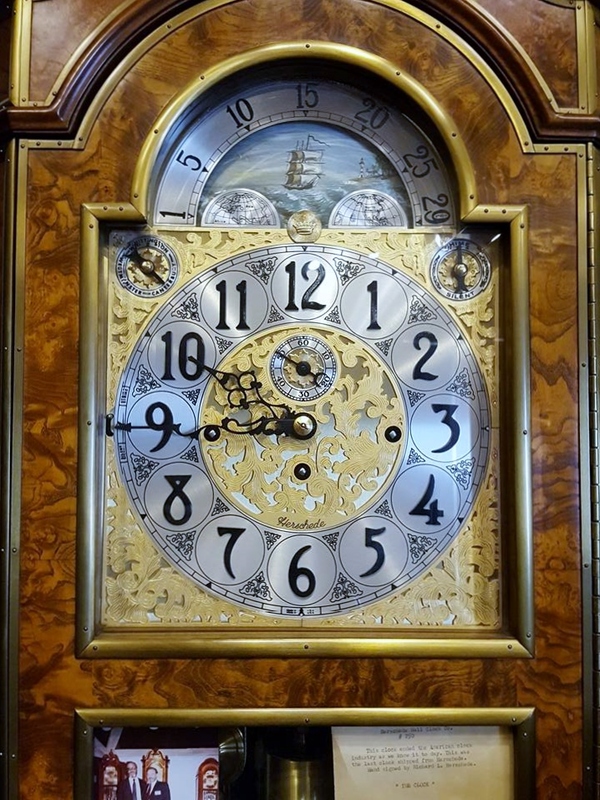 There are many more clocks than we can fit in a blog post, so take the time to visit Champ’s Clock Shop. The friendly folks there will be happy to show you around their timekeeping wonderland. Champ’s Clock Shop, 3834 King Drive, Douglasville, GA 30136. Hours: Tuesday – Saturday 9 a.m. – 5 p.m. Closed Sunday and Monday. Appointments available. Join us next week, for another installment of Peaches on the Road, and we’ll tell you about a fresh, new place to eat on 30A. ← HIDDEN GEM RESTAURANT CHALLENGE #8: Geaux to Gumbeaux’s in Douglasville, Ga. Being a lover of clocks, I was delighted to see the unique and magnificent clocks you featured here. Thanks again, Picky Peaches. Truly a Hidden Gem of a business in West Georgia! Worth the drive! Always our pleasure to find unique businesses!